A new method of corporate taxation termed proportional tax is described. It is simpler than existing methods of taxation yet it appears to be powerful in implementing economic policy and directing corporate behavior in desirable directions. Proportional tax for corporations is different from proportional tax for individuals. While proportional tax for individual implies that they pay the same proportion of income as their tax, whatever is the level of income, for corporations it implies that they pay a tax at a rate that is proportional to their net profits. While communism appears to have failed in most countries, capitalism has been more successful in meeting human needs and improving the quality of life of humans. However, it has not been an unblemished victory for capitalism. Problems have occurred because of an excess of greed or because of use of unethical practices to satisfy that greed. It may be pointed out that unethical practices are frequently more insidious than illegal ones. Illegal practices can be dealt with by law but it is impossible to deal with unethical practices until new laws are created to cover them. The huge compensations, bonuses and severance packages that senior executives of some corporation draw fall in the realm of unethical practices. It has led to the financial crisis of 2008. Unfettered greed of corporations have also led to rising inequalities that have forced some to homelessness while the wealth of the world has been captured by fewer and fewer individuals. Various mixed models that combine elements of both, communism with capitalism, have also been attempted in parts of the world. Some of these have failed such as those employed in the period between 1950 and 1990 in India while some have done fairly well as in Scandinavian countries. Whereas communism depends upon the state to provide goods and services, capitalism depends upon individual initiative to meet the same needs. Except for minor goods and services on a small scale that can be produced by an individual or an individual family most goods and services require that humans get together to create organizations for the purpose. Such organizations as legal entities are corporations and they are the main stay of a capitalistic economy. It has been recognized that capitalism cannot function without regulation, for example preventing the development of monopolies that eliminate competition. If national economies have to continue with capitalism they must continuously evolve new practices, laws and regulations. It must be pointed out that whatever the economic model used, it is a tool to serve humans and wherever that purpose is defeated, resulting in inhumane consequences then economic activity degenerates into a tool for exploiting humans rather than serving them. While regulations control undesirable behavior of corporations, they also make life difficult for other corporations that may be behaving perfectly well. Thereby regulation also hampers economic activity. Therefore, in designing regulations care must be exercised towards simplicity and ease of application of the regulatory regime. In the present connected world, it is a wise course to study best practices of other countries and adapt these to suit one’s needs rather than inventing new practices that may turn out to be unsuccessful in the long run. However, this does not mean that new regulations need not be explored. Human innovation is an ongoing process just as human evolution is. It is with this in view that a new way of implementing corporate taxes is introduced briefly in this note. The simplicity of this new idea is such that it neither requires a lengthy explanation nor support by several other studies and references. The new method termed Proportional Tax is simple to apply; in fact it is simpler than existing methods that have graduated discrete slabs. Aside from being a way to tax, the new proposal may also be used as powerful tool to discourage some of the worst practices of capitalism while encouraging the best ones. This new method was born out of a somewhat informal note by this author elsewhere called the ‘Rule of Ninety’ and it may also be referred with this latter name. It may be pointed out that the new proportional tax is specific for corporate taxes. Analogous methods do not apply to individual taxes. Most countries impose corporate tax, also called corporation tax or company tax. Generally corporate taxes are charged as a percentage of net profits after allowing for certain deductions. Rates may vary between ten and fifty percent in most cases. While corporate taxes are an important source of revenue they are also used as policy measures, for example, exempting a certain industry such as the renewable industry from taxes or charging a graduated rate of tax to encourage new small businesses. However, existing methods of taxation are a limited tool in implementing policy. For example, they cannot prevent development of huge corporate monopolies on their own nor can they prevent excess profiteering. The new method called proportional tax can do all that existing methodologies of corporate taxation do, while doing much more to control corporate behavior in desirable directions in a straight forward and simple manner. 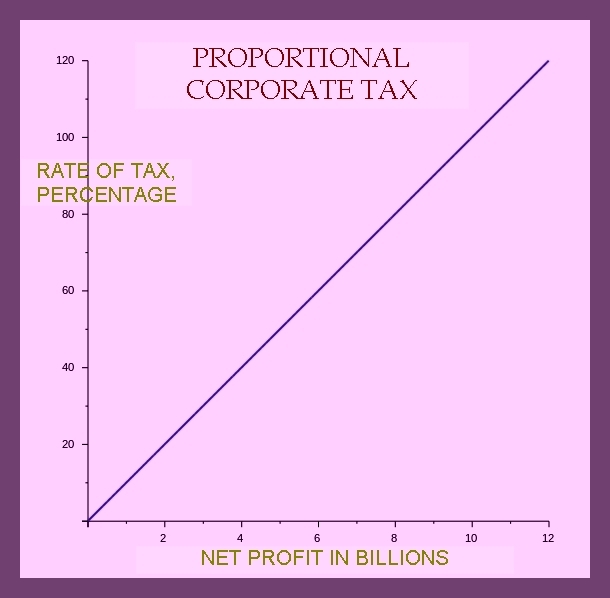 Proportional Tax implies that rate of corporate tax is proportional to net profits, NP, in a continuous manner rather than in discrete slabs. A constant of proportionality is required to determine the tax rate. Aside from the proportionality constant the new method may also prescribe a minimum threshold rate of corporate tax to prevent near zero rates of taxation for companies making small profits. It will be shown that this simple method has powerful mathematical properties that make it a powerful tool in the hands of policy makers and the public. The constant of proportionality, M, here is shown as an inverse constant in order to give it a physical meaning. M may be visualized as the net profit of a reference virtual mega corporation that has a very large profit, larger than the expected profit of any other corporations in the country. Thus if a company makes one fourth the amount of net profit as M then its corporate tax rate shall be 25 percent as per the given formula. Figure 1 illustrates how corporate tax rates vary with net profits in billions of dollars. In this illustration, M has been selected as ten billion dollars. If a minimum threshold tax, T is selected as 20 percent and if M has been chosen at the outset as a suitably high number e.g. two and a half times the maximum net profit of any company, then tax rates for all companies in this example shall vary within a narrow band of twenty and forty percent. Different rates of tax can be promulgated depending upon choice of M and T. The variation of rates is a simple linear one but its ultimate effect on corporations is far from linear as shown next. Proportional tax for corporations is different from proportional tax for individuals. While proportional tax for individual implies that they pay the same proportion of income as their tax, whatever is the level of income, for corporations it implies that they pay a tax at a rate that is proportional to their net profits. 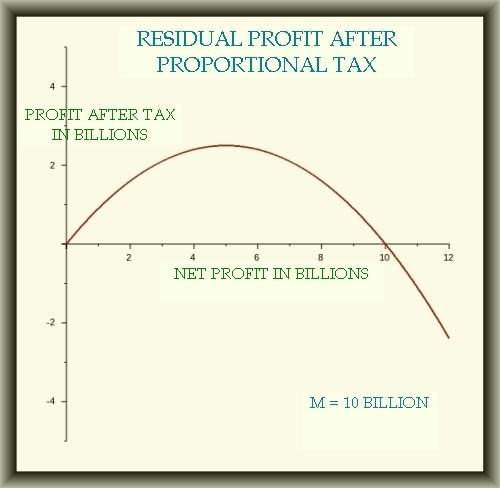 Figure 2 shows how residual profit after tax, P varies with net profit, NP, if M= 10 billion and T = 0. The unique feature of this variation is that beyond a certain level of net profits, residual profit of a company begins to fall and in extreme cases becomes negative. This very feature of the new proposal is a powerful controlling mechanism that may be used if a country wishes to reduce the size of certain corporations e.g. banks that might become too big to fail. All companies would like to make the highest possible residual profits. However, they will be obliged not to charge such a high price for their products, even if they can, so that net profits increase beyond the point that their actual profit reduces or even results in a loss for the company. Constants M and T can be chosen for the economy as a whole or they may chosen as different for different sectors of the economy. Thus if a country feels that a monopoly has developed in the automobile sector and other players need to be encouraged, it may set M as a value equal to the expected profit of the particular monopolistic automobile company. That company would then end up paying near hundred percent taxes while newer smaller players will be encouraged to develop with lower rates of taxes. It must be noted that since tax rate depends on net profits, the single large automobile company can still keep new players out by bringing down its prices and reducing its net profit in order to maintain a high residual profit. But that is something that will benefit consumers. It is good corporate behavior in the interest of all. This type of monopoly needs to be encouraged rather than discouraged since it has become self regulated from within rather than from competition. A new way of applying corporate taxes called proportional tax is described. An appropriate choice of parameters, M and T, is required in the new method of proportional tax, for different sectors of the economy or the economy as a whole. The new method appears to be a powerful tool to manage corporate behavior so as to bring out its best its best while discouraging practices that are detrimental to society at large. It merits further study by economists and policy makers in order to explore its full implications before implementing as a new corporate taxation method, if desired. 1.Steven A. Bank (2011). Anglo-American Corporate Taxation: Tracing the Common Roots of Divergent Approaches. Cambridge University Press.